The remarkable image was captured on June 5, 2017, by a camera aboard NASA’s Mars Reconnaissance Orbiter, which obtains several images of the plucky little planet crawler each year, according to NASA. 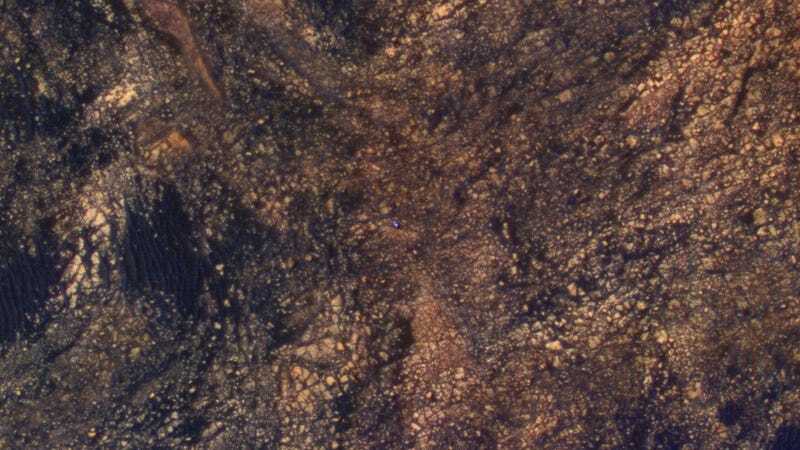 Curiosity appears as a blue splotch amid an intimidating group of rocks, cliffs, and dark sand. When the image was taken, the probe was heading uphill to an area containing hematite outcrops. Mission controllers are continuing to look for evidence of prior habitability on the Red Planet. If the colors in this image look exaggerated that’s because they are. The deliberate contrasts are intended to show differences in Mars’ surface materials, which makes the rover look bluer than it actually is. Keep on truckin’, Curiosity! We’re all rooting for you, even though your wheels are getting pretty worn and you’re 241 million miles away.